In the past, roles, system privileges, and table privileges were used to control the functionalities allowed to database users. However, roles and privileges don’t have enough granularity to effectively restrict what work a user may do. For example, you can grant the privilege “ALTER SYSTEM” to a user, but with that, you are allowing that user to change any database parameter. “ALTER SYSTEM” is not granular enough to enable the user to change some database parameters but not others. Even worse, there is no way to allow a user to change a specific database parameter with a range or list of values but disable another range or list of values. This functionality has been requested by DBAs for years and finally Oracle has heard us. Oracle has introduced several new features in its newest version, 12.2.0.1. One of the most important features is “Lockdown Profiles”. Lockdown Profiles provides the granularity we were talking about. With this feature you can enable and disable database functions, features and options. It even lets you specify a range or list of values that may be used. Unfortunately, you cannot specify which functionality to enable or disable along with the CREATE LOCKDOWN PROFILE sentence. To do this, you have to use the ALTER LOCKDOWN PROFILE sentence separately. FEATURE: Allows you to enable or disable database features. To see the full list of features that you can indicate, check here. OPTION: The two options you can either enable or disable are “DATABASE QUEUING” and “PARTITIONING”. STATEMENT: You can either enable or disable the statements “ALTER DATABASE”, “ALTER PLUGGABLE DATABASE”, “ALTER SESSION”, and “ALTER SYSTEM”. You can specify granular options along with these statements. In the three functionalities, you can also use clauses like ALL and EXCEPT, which allows you to include or exclude a set of features instead of specifying them one by one. In the following example we will disable two features, one option, and one statement. The next example is similar to the previous one, but here we are specifying a minimum value and a maximum value. All the values between are allowed, while all the values outside of this range are disallowed. In the next example I am disabling the feature “COMMON_USER_CONNECT”. This feature disallows common users to connect to pluggable databases directly. All common users must first connect to CDB$ROOT and then jump to any Pluggable Database. The last example disables the option “PARTITIONING”, which means I cannot use any operations that relies on partitioning. As we have seen, I created the lockdown profile directly without specifying whether I want that lockdown profile in one specific PDB, or in all the PDBs, etc., I just created it. Don’t worry about it: The creation of a lockdown profile doesn’t mean it is enabled by default. Lockdown profile works like a Database Resource Manager Plan; you can create as many as you want, but only one is enabled and it must be enabled explicitly. And enabling a lockdown profile is similar to enabling a Database Resource Manager Plan; it is enabled by a database parameter. So far we have created the lockdown profile “WANNACRY_PROFILE” and we have customized it but we haven’t enabled it yet. You can enable a lockdown profile in one specific PDB, in a set of them or in all PDBs. If you want to enable the lockdown profile in all the PDBs you have to be connected to CDB$ROOT and set the database parameter “pdb_lockdown” to the name of your lockdown profile; in this case, “WANNACRY_PROFILE”. 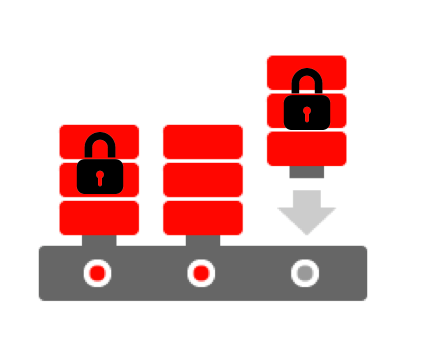 If you want to enable the lockdown profile in a specific PDB, first you have to connect to the specific PDB and then you have to set the database parameter “pdb_lockdown”. In the following example we have a CDB called “db12c” with two PDBs, one named “PDB1” and the second one named “PDB2”. We will enable the lockdown profile “WANNACRY_PROFILE” only in “PDB1”. As you see, even if the user has “alter system” privilege it is not allowed to change the database parameter because of the lockdown profile. Testing the parameter parallel_max_servers. The range we specified in the lockdown profile was [10,39]. As we explained before, all the values outside of this range are disabled, while the values between these values are allowed. To drop a lockdown profile is easy. You just have to execute the following sentence from CDB$ROOT. You don’t have to reset or clean the parameter pdb_lockdown in all the PDBs that are using this lockdown profile (although I strongly think it should not be this way). When you execute this sentence, all the PDBs using the lockdown profile will automatically stop using the settings provided by this lockdown profile. In this article, I outlined the required steps to create a new lockdown profile, I explained which kind of functionalities we can enable and disable, and I provided several examples. I provided comments to help you quickly understand how to use lockdown profiles and take advantage of them; very important in an era where the security is of utmost value and a finer granularity is needed to restrict people to only those tasks necessary for their role.